Close to two decades later, when she was nearly forty years old, she defied social custom by traveling alone again, this time as a wife (now married to Crisp in reality) and mother, on an overland journey by palanquin throughout East India. During this journey, which involved seeing many local sights as well as dancing, singing and drinking tea with her company, she escaped abduction, but kept a diary. Marsh lived from 1735 to 1785. Born in Portsmouth, England she was conceived in Kingston, Jamaica. Her father was a ship’s carpenter and dockyard official for the Royal Navy. These bare details appear mundane at first, yet the cosmopolitan significance of these places in the eighteenth century and of her father’s naval career intimates the extraordinary richness that a fuller account reveals of this headstrong and independent woman’s life. Filled with severe shocks, pains and turns of fortune, Marsh’s life was profoundly shaped by the dramatic changes taking place in the world at large in the eighteenth century, including those brought on by England’s global commerce and expansion, increased opportunities for travel and economic mobility for the English, and different wars, including the Seven Years’ War and American War of Independence. Charles E. Young Research Library’s Special Collections holds a bound manuscript volume of Marsh’s written accounts of the two noteworthy episodes in her life as a traveler, mentioned above. In addition to the stories they tell, the accounts are notable for their ethnographic details, and their view of eighteenth-century culture, including the role of women in this time period as well as British imperialism and race relations. Material culture scholars might be interested in Marsh’s descriptions of Moroccan and Indian landscapes and gardens, architecture, interior décor, household objects and food, in addition to the dress of native inhabitants. Marsh also describes the different states of horror, melancholy, grief, joy and boredom that accompanied her experiences, which in Morocco were especially turbulent, and in India reminiscent of the eighteenth-century social worlds depicted in the novels of Frances Burney and Jane Austen. Throughout, she records the physical experiences of extreme climates, including her acute thirst and fatigue when taken captive by Moroccans and forced to ride for hundreds of miles on a mule, and of being unable to lie on her sleeping mat in India because the ground was so hot. As material documents, the manuscripts indicate the different processes involved in recording and creating the memories of Marsh’s experiences on paper, and making them available for posterity. The two—Marsh’s Moroccan captivity memoir and her East Indian tour diary—were bound together by John Marsh, her brother, in red leather. A bookplate bears his name, and notes inserted by him introduce the memoir and the diary, placing them in the context of her life. The memoir appears to be written in John’s neat hand and the diary in Elizabeth’s own, which he explains was given to him by her daughter, Elizabeth. She eventually died in 1785 in Calcutta, of breast cancer at the age of forty-nine after undergoing a mastectomy without anesthesia a few months earlier. The extracted tumor was said by her uncle George Marsh to have weighed five pounds. In its very fragmentariness, the diary manuscript offers direct contact with the vital impulse that led Marsh to exert her own hand in shaping what she must have known were remarkable circumstances at the time—a woman traveling without her family in a remote country—through documenting them in writing. In doing so, she has left a precious record of her life as an eighteenth-century woman who inscribed her own way into the history of the modern, globalizing world. Julie Park is the author of The Self and It: Novel Objects in Eighteenth-Century England (Stanford University Press, 2010). She is preparing for publication her second book, “My Dark Room: Spaces of the Inner Self, 1651-1811,” which examines how eighteenth-century English subjects created inner worlds for themselves with the material features and designs of spaces in everyday life. She is the Association of Research Libraries/Society of American Archivists Mosaic Program Fellow at UCLA Special Collections as well as a research associate at the Huntington Library. 1. Elizabeth Crisp (née Marsh). 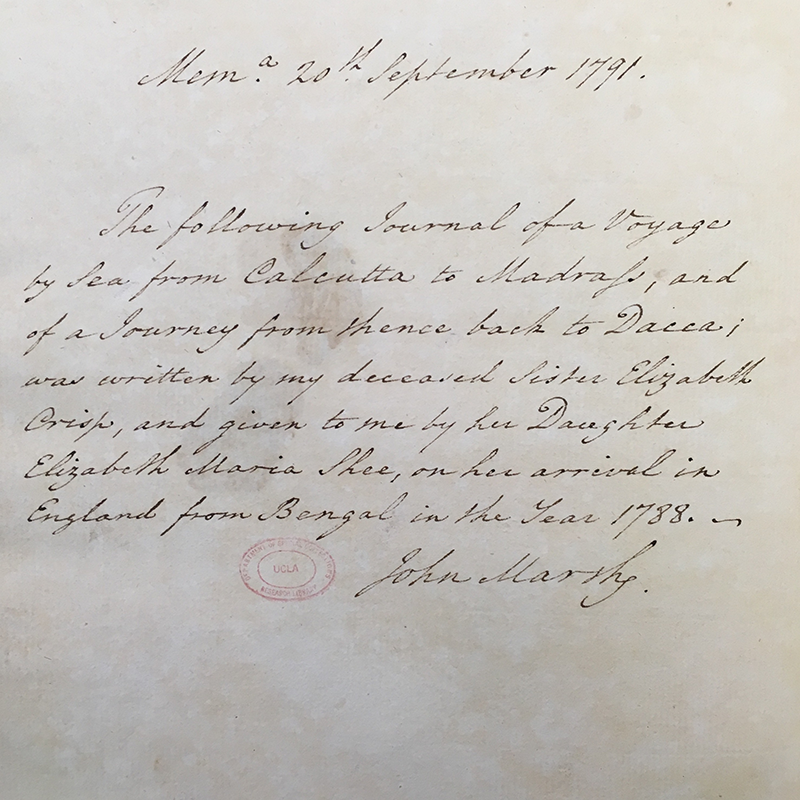 Journal of a Voyage by Sea from Calcutta to Madras, and of a Journal from there back to Dacca (); Narrative of her Captivity in Barbary (1756). December 13, 1774-June 20, 1775. YRL Special Collections 170/604. The life of Elizabeth Marsh was made more widely known over a decade ago by the publication of Linda Colley’s gripping biography, which was named one of the top ten books of 2007 by The New York Times. Her book contributes greatly to the understanding that the events in Marsh's apparently inconsequential life were direct functions of the sweeping changes taking place in world history during her lifetime.